Nowadays, more and more people focus on the user experience in the IT world. When we visit websites or work with applications, we expect that the usability of the tool will allow us to work or find necessary information in the shortest and the most efficient way. In the SAP you can also increase the user experience by implementing the predictive (type-ahead) search helps. Let’s imagine, that you want to select the currency, that starts with P, but you don’t really remember what is the exact currency code. Normally, when predictive search help is not used in this scenario you have to write some patterns, for example, P*. Then you have to press F4 for a help dialog and from there you can choose the value that you are interested in. Thanks to predictive search help, the process described above is simplified. When the user starts typing something – immediately will see the proposals, as shown on the screen below. Letter P was written and immediately proposals of currencies that start from P were displayed. You can enable type-ahead typing, if your SAP system is at least 7.4 SP06 or above and if you use SAP GUI 7.31 patch 5 or above. You can still use the features if your system is on ABAP 7.4 SP05, but then you have to do some manual steps as described in the SAP Note 1861491. 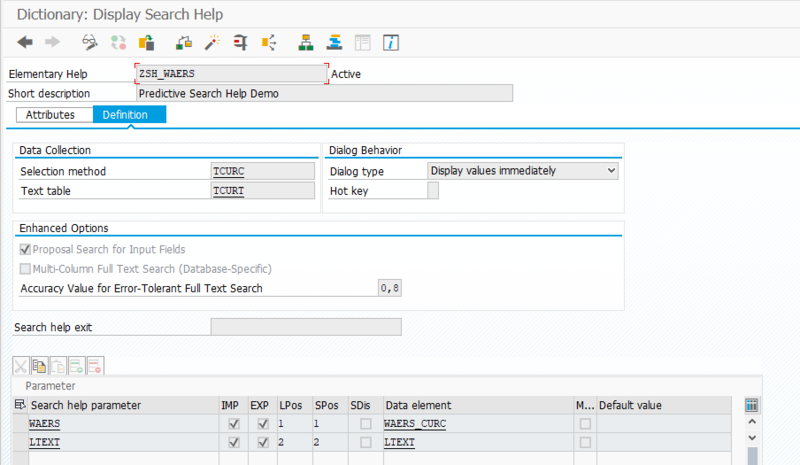 How to enable predictive search help in SAP? First, let’s go to transaction SE11 and create a new search help ZSH_WAERS. For our purpose, we will use the Elementary search help. 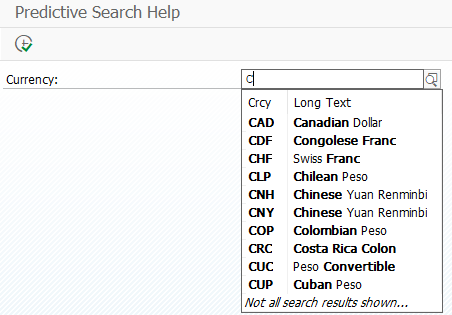 We want to create a search help for currency and therefore in the Data Collection as a selection method, we have to type TCURC and in the dialog type, we want to use Display values immediately. The next section Enhanced Options is the feature that we have been looking for and that was enabled on ABAP 7.4 SP06. In this section, you can see checkbox Proposal Search for Input Fields. Make sure that you mark it – this will allow you to use predictive search help (type-ahead search help). 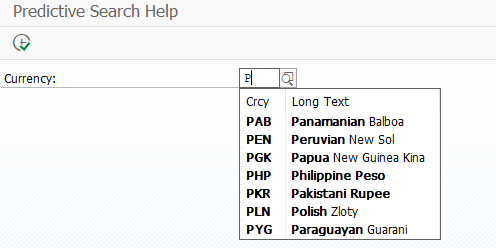 At the end provide Search Help parameters, save and activate the Search Help. PARAMETERS p_curr TYPE WAERS_CURC MATCHCODE OBJECT ZSH_WAERS. Run the report and confirm that immediately when you type a letter- you can see the proposals. Did you like this quick tip for predictive search help in SAP? Let us know in comment!